I was fortunate to partner with the Detroit Kite Festival for my impact project. 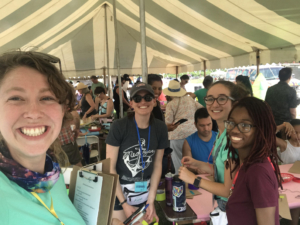 Detroit Kite Festival uplifts kite flying and creation as a platform for radical inclusion, communal play, shared healing, and the celebration of culture and history. It is a true community event in Detroit that began with a pitch at the Belle Isle SOUP. Margo Dalal, the founder of the Detroit Kite Festival and my liaison for this project, won this community grant in 2016. The inaugural Detroit Kite Festival was a success, with over 3,000 attendees on Belle Isle throughout the day. 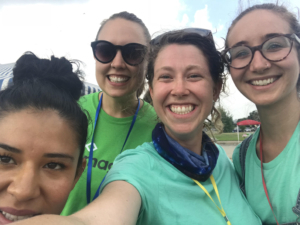 I wanted to be involved in making the second year of the Detroit Kite Festival successful and leverage the skills that I’ve learned in Challenge Detroit to capture meaningful community feedback. 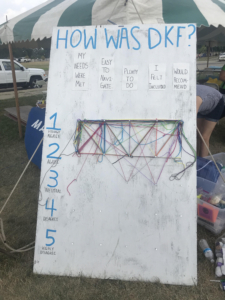 My design question: How might we capture meaningful feedback from Detroit Kite Festival attendees in an interactive and creative way? 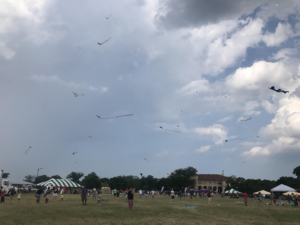 The Detroit Kite Festival took place on Sunday, July 15. I had three specific avenues to collect information from attendees. First, I had two jars and a pile of buttons on the welcome table. I asked visitors to put a button into the appropriate jar – one said “live in Detroit” and the other, “live elsewhere.” This activity allowed for children to put the buttons in for their family members, started the conversation with visitors, and provided a means to collect data. Out of the number of attendees who stopped by the table, there were 249 people who live in Detroit and 335 people who live elsewhere. Second, I did surveys. Walking around with clipboards, I worked with a few volunteers to ask attendees for their feedback. 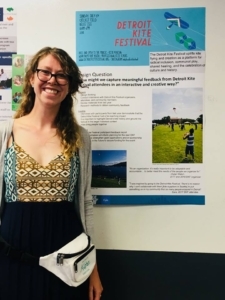 With over 180 completed surveys, we gained information about how people found out about the festival, what they did, how old they were, who they came with, their favorite part, any recommendations for improvement, and their contact information. Folks rolling up their sleeves and making and flying kites together. Inclusive. That so many people come together to fly kites! People helping others getting kites in the air.